Wyatt-MacKenzie Publishing Blog: What Would You Do All Day, Every Day, For Free? What Would You Do All Day, Every Day, For Free? I heard this on a video and smiled. Well, I'm an indie publisher, so... I'm doing it! My dream for as long as I can remember was to be a graphic designer. 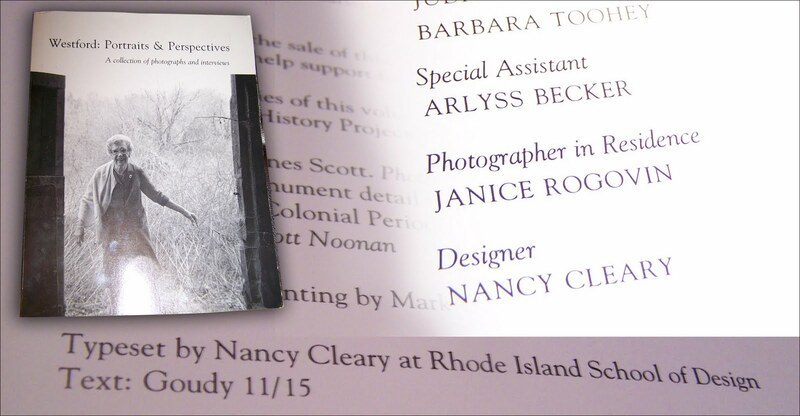 My first published job -- with my name on the colophon (see above) -- was a book design for my hometown in 1988, while I was still in college. I typeset the book on a Linotron and made mechanicals for the printer. I was so proud. (I still am -- I did a great job!) That's all I wanted to do, every day. When I began working with entrepreneurs and authors I realized this thing I loved to do had an intrinsic value -- I could make the smallest entrepreneur look like the biggest corporation with a professional, compelling branding package (or "identity" as we called it a few decades ago!). For many years I ran a lucrative graphic design studio, and along the way met many incredible women entrepreneurs and writers. I remember the day I sat with my journal, imagining how I could "give" what I had to these women who needed it. I wasn't sure at that time the way this would evolve, but looking back now, I see clearly -- the creation of my independent press gave me the opportunity to pour every ounce of passion, and talent, into women and projects I believed in. This past weekend I got to watch Bravo's "Work of Art" reality show and the assignment was a book cover design. (Loved it!) It sent me right back to crits at RISD. I loved art school. I was in heaven. I was doing exactly what I wanted to do, all day, every day. I worked hard, and my critiques were amazing. Hearing the contestant's excitement over designing a book cover that could be published by Penguin was full-circle-fulfilling. Those very thoughts -- imagining my design on the cover of a book that sold in real bookstores -- drove me to get where I am today, not only the book cover designer, but the publisher of over 100 titles currently being sold around the world! It hasn't been easy, I've had to learn a great deal about the publishing industry, and about publicity, and distribution (which is changing daily). And, without an amazing consulting program I wouldn't be able to finance my passion. It's actually not free, but rather costs quite a bit -- the role of publisher is "do everything and pay for everything, all day, every day" but I love it.